The Leafs could still be convinced to trade Kapanen, the Avalanche and Oilers prepare to make moves and more in today's NHL Rumour Report update. With the trade deadline is just a month from now, the NHL rumour mill is kicking into overdrive. Not too long from now our NHL Trade Deadline Live Blog will get going, but in the meantime you can check out our NHL Trade Rumour Board for a league-wide overview of rumours that are out there. There's a lot of smoke billowing between Toronto and Carolina. The Maple Leafs continue to heavily scout the Carolina Hurricanes, with their eye on defensemen in particular. Brett Pesce appears to be their main target, but Dougie Hamilton and Justin Faulk are rumoured possibilities as well. The Leafs appear to be unwilling to part with Carolina's top ask - Kasperi Kapanen - so it's unclear where talks go from here. 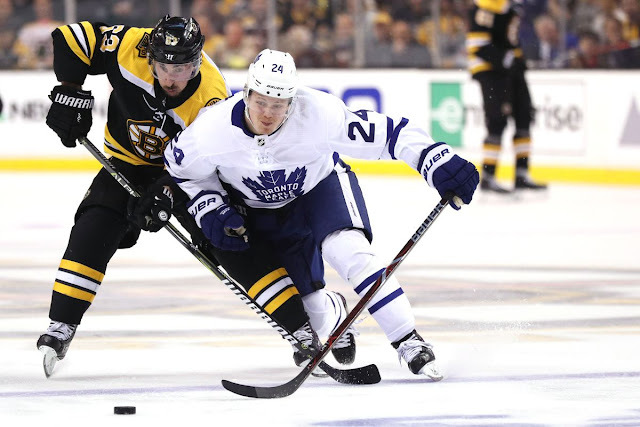 Some rumblings indicate a Michael Ferland AND Brett Pesce package could coax the Leafs into giving up Kapanen as part of a bigger package, so we'll see. The Leafs continue to keep tabs on the Kings' Jake Muzzin as well. Buzz continues to build around Oilers pending Cam Talbot, who is rumoured to be on the move following the extension to Mikko Koskinen. It's believed the Oilers have talked to non-playoff teams in the East about Talbot but the dialogue hasn't progressed because of Talbot's no-trade list. Among the teams this might include, in my opinion: Philadelphia, New Jersey, Florida, Ottawa, Carolina and Detroit. Rumours suggest the Flyers are looking for a short term solution in net, while I would say the path is clearest to a starting job in Carolina or Detroit. Early indication suggest the post-Chiarelli Oilers are not going to be spending assets for a quick fix this season. Rumours had suggested that draft picks and players like Jesse Puljujarvi and Kailer Yamamoto might be available, but that appears to be off the table now. Nonetheless, pending UFAs like Talbot are still likely to move at some point. This isn't a brand new rumour, but it is a re-hashing of an old one that had seemingly gone away: the Avalanche appear to be shopping pending RFA Nikita Zadorov. Colorado find themselves in the thick of the wildcard race, but are asking around to see what they could get for the arbitration-eligible blueliner. Offensive depth appears to be a priority for the Avs right now - Kevin Hayes and Andre Burakovsky are two rumoured targets.